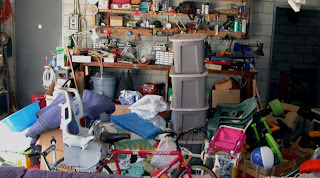 ROSEMARY HARRIS: Happily neither of these pictures depicts my home - but...like a lot of people I occasionally wonder, why the heck do I have all this STUFF? But every closet, chest and trunk is filled to the max. So I'm requiresd to make periodic purges. Right now I have a Bagster in my driveway. Have you seen them? They're very large, tarp-like bags which can hold a couple of tons of debris. They cost about 30 bucks and when they're filled you just call Waste Management and someone brings a truck and hauls it away. It's one of new favorite things. And for the past few weeks I've derived an enormous amount of pleasure filling it. Broken chairs that I've never gotten around to fixing. Falling apart willow fencing. The tag sale shutters I never used in the whimsical garden I never made. The broken window pane that I never got crafty with. 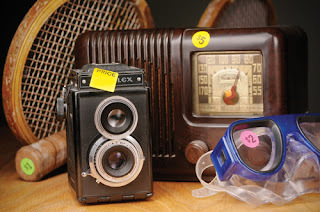 So explain to me how, with a clear conscience, I went to not one, but two estate sales yesterday. What if I really liked something? Where would it go?? Mercifully I resisted the charms of the outdoor furniture sets, the stone planters, the vintage rattan sunroom furniture, and the ubiquitous floral prints which seem to be at every estate sale I've ever gone to. That said, I came home with three very large resin planters, a black wrought iron coffee table, wicker footstool/table, two small ceramic planters and about 20 books - history, vintage Peter Rabbit and a copy of Anne of Green Gables, which I've never read and someone on JR rhapsodized about. And a Stangl vase ($8) that gets my vote for deal of the day. Is this schizo behavior? Like ordering diet soda with an order of french fries? I certainly wouldn’t call it “schizo behavior” . . . and I’d quite probably do the same thing. I am good at saving, not so good at tossing out, and not at all concerned about it. My “things” give me pleasure . . . make me smile or simply make me happy. Lots and lots of books, lots and lots of Precious Moments, a gazillion photographs, treasured knick-knacks . . . it’s just me and I admit to not understanding the folks who feel compelled to continually toss everything out. I think you should be happy with yourself; sit back and take a moment to enjoy the “stuff” . . . . I am the poster child fr "too much stuff." Unfortunately, my husband is a close second. "This will be important someday" seems to be my mantra. I have cartons of STUFF everywhere. I've been trying to purge my house of stuff but I can't seem to make a dent in it. Other than clothes...as I lost weight I donated all my too-big clothing to charity or consignment. Why can't I do that with the other stuff? Books, vinyl records (although I have no machine on which to play them), political memorabilia, hubby's tools that he'll need for that one special application that hasn't happened in 40 years,his radio-control airplanes and parts, boat supplies (and the boat is no more), etc. So, yes, I have to believe this behavior is normal. Otherwise it means I'm--- no, it's normal! It is normal behavior, at least for me. I think humans evolved with a tendency to collect and store up things they might need. Our ancestors did it with edible tubers, and lengths of strong vines that might come in handy. It was hard to find stuff like that back then. We continue with the stuff we have about us, like beautiful green manhattan glasses and adorable vintage children's books. I got a jolt of desire when you mentioned rattan furniture at an estate sale even though I don't own a porch anymore. Excuse me, Ro, but I have to run. My 100,000 baseball cards are trying to get out of the spare bedroom closet again. I have to beat them back inside, and then go buy some new packs of 2013 Topps, see who I get. I'm sure there's some scientific law that covers this -- something about conservation of mass. A copy of Anne of Green Gables? A Stangl vase? Irresistible. I'm standing here with both arms up in the air screaming "GOAL!" We have been notified by the city that new water meters will be installed in every home. So begins Operation Clear the Basement. Still have unpacked boxes from our move...15 years ago. I need several Bagsters. Oh, Ro, you are singing my own sad song. Seven years ago my father-in-law died, age 93, after living for more than 65 years in the same home. It was utterly beyond my husband and his twin, unmarried brother to dismantle the home, so it fell to me (otherwise, everything--including the contents of the fridge--would still be sitting there). After going through the house half a dozen times to cull, managing the removal by family members of whatever they wanted, and then overseeing a massive estate sale (and STILL missing stuff), I decided not to do that to my own kids when the time comes. Since then I've taken probably 40 carloads, plus an entire truckful of stuff out of our house. I've had four different businesses here in the last 28 years, plus raised three kids, and had another kid live with us for a year, all of whom shed belongings here like snakeskin. The library came and took 1,000 books five years ago, but I'm sure I've bought more than that since then (thank goodness for the Nook!). The basement was the last place that got the treatment, and I was feeling pretty good about things, until this past week. A friend is clearing out HIS parents' things, and offered us a twin bed with new mattress. I said yes, since our kids all live out of town, and sometimes they're all here at once. When they dropped off the bed, they also brought two shelving units, one of which takes up an entire wall! I don't know what the hell I'm going to do with this stuff now. And I caught his wife leaving an old cooler in our garage. The sneak. Never mind all the knickknacks I brought home from my daughter's mother-in-law's home and HER estate sale. So you have company, Ro. Sigh. In my college dorm freshman year, our favorite snack was Fluffernutter sandwiches and Tab! We are all contradictory in our behaviors. I can see what needs to go from our garage (the things my husband decided to keep -- the old cushions from the lawn furniture?) but "my stuff"??? I just like looking at it. The only problem I see with the Bagster is that it doesn't cull the stuff for you -- you've still got to touch it all and make the decisions. For me the clutter in the closets & garage (no basement or attic, thank goodness) comes mostly from undone projects. Those shutters? Your whimsical garden? Bring them over and we'll get out the multipaned windows I bought 20 years ago for $1 each, the old mailboxes I snared when the stand out on the road that serves the whole neighborhood collapsed and we had to build a new one, the broken bird feeders I keep thinking would make a great art piece ... Oh, what we could do! 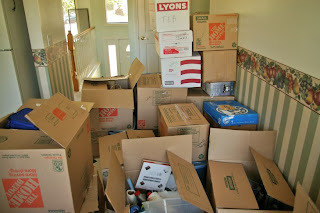 It would be too embarrassing to tell you how many boxes are piled up in the bedroom, in closets, and elsewhere - although it seems that most of you would understand. I no longer go to tag sales, which is at least a step in the right direction! My basement used to be so neat and well-organized. When we cleaned out our mom's house after her death fifteen years ago I took a lot of things that I don't need or want, thinking that someday some of my nieces or nephews might like to have them. It has not yet happened, and now I trip over boxes whenever I make a field trip to the basement. We won't even get into all the books - Mom never met a book she didn't want to read, and neither did Dad, who died many years earlier. (I blame my book-hoarding on them!) Up here in the living room I am looking at the bookcases overflowing with books and all the table surfaces covered with books. I'm getting better at getting rid of things I know I'll never use--those old cushions for the outdoor chairs that are stained and have lost their cush, crafts I'll never get around to, gifts I've received but will never ever ever be able to regift. But I'm drowning in the stuff with emotional attachment: framed photos, old books, little boxes that xyz friend/family member brought me from some cool farflung location. I can't part with those yet. And yes, I refill the space with things like a collection of old (I can't even claim they're all antique, but some belonged to grandparents) typewriters. Cool, right? And BIG. I think we expand to fit the available space. I am So glad you wrote this. I feel So much better now. I live in a Senior Apartment Building and have downsized many times. Then I go to those garage sales and upsize again. Good luck my Dear, from a Kindred Spirit, with much experience. I do however watch Hoarders, for inspiration. (for what Not to do, thought I'd clear that up). Ro, I need the Bagster! I don't think we have them here... Which means we are going to have to pay our yard guy to haul a truckload of old, rotten, ratty stuff out of our "shed". This is what I've taken to calling the old garage that was on our property when we bought our house eighteen years ago. I won't repeat what my hubby calls it. But I am determined that it will actually become a place (unlike the new garage, which is filled to the brim with hubby's stuff) that will hold things like ladders and wheelbarrows and garden rakes. What a concept. Resisting yard sales. I don't need anymore antique quilts. Or vintage glassware. I think I'm finding generally that I want less and less "stuff." I have friends that have gone through the dreadful experience of clearing out after hoarding relatives. I was just investigating Bagsters, for our basement. Then I began to think how easy it would be to get rid of a body that way.... The Bagster Murder. One June day I picked up two winter knitted hats from the dining room table and opened a drawer to put them away - and there was no room in the drawer. OK. I started a "One Piece of Junk per Day" project. I would open a drawer as far as it would go, reach in the back and pull something out. If useless it went straight into the kitchen trash bag. If useful - but not needed by us - it went into a box in the hallway. When the box (or bag) was full it was dropped off at a charity thrift shop collection site. Some valuable stuff was found too. It's time to start over too. Anne of GG? And you've never read it? Great find for you. Enjoy. Sigh. I feel your pain. I've been involved in 3 house clearouts in the past 7 years, some of them ongoing, because of the lure of storage lockers. Right now I have 3 flats ready to go the the community living thrift shop. Honestly. Soon. Trouble is, I also run them past the local 2nd hanf book store, who usually take a few, for credit for... yes, more books. Debs - yes...the mosaic something we will someday make! I've got vintage plates and tiles - would you like some? I've been trying to throw out 9 Days a Thing (read that somewhere) but the things I'm throwing out are usually smaller than the things I'm acquiring.. The Bagster Murder - wait- Berkley is already doing it - it comes out next Tuesday, by Emily Bancroft! me again. Sometimes I look at a bunch of stuff (e.g, my stack of towels) and say, Okay, I'm going to ditch 5 of them. And (big victory, but not for my closet) a few weeks ago my partner asked me to help him go through his shirts, now that he's no longer a math teacher. WE GOT RID OF 60+ SHIRTS!! Can I say that I found myself feeling disappointed that you didn't invite me along to the estate sales? (Ramona and I first bonded at flea markets!) I guess it's a good thing we don't live in the same town. But.....I kinda wish we did! Postscript to 3 cartons of books, above: done! 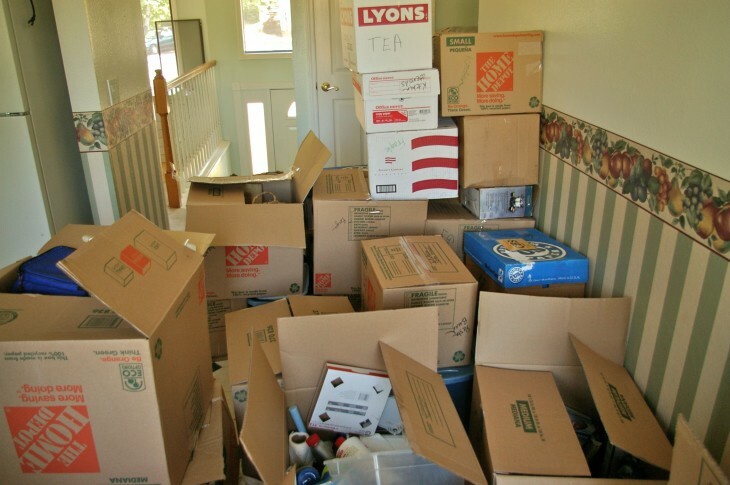 We were a military family for many years so we moved frequently. This helped with the clutter since you don't want to ever go over your moving weight! However, we've been in the same house for 7 years now. A record amount of time for us. We have filled every closet and the attic is full of boxes. We do have room in our 3 car garage for 2 cars, so that's something! that's my big weakness. "Oh I might read that again. I might read that some day. My pal signed that one, I can't throw it out"--and so on. But you guys, we helped some relatives clear out and pack a storage unit they'd had in another state for at least 3 years. If you haven't missed something in 3 years, you can probably do without it...don't you think? so step away from the storage unit idea--it only leads to heartbreak! Oh TMS, I have it. At GROS, I'm not so good. But at BMS I'm great! Rosemary inspired me: I planted the mailboxes I'd been saving today, in an odd spot the builders left along the driveway (13 yrs ago) that the wild flowers hadn't yet taken over. Photo on my Facebook page. But I've got rules: never buy (or dumpster-dive) anything that needs glued/painted/stitched or fixed up in any way; never buy anything that can't go straight into its place in the house or garden; nothing has to match; always buy pretty china and glass - I've had parties where every plate in the house was used; you can never have too many napkins . . .
Yay Leslie! The mirror hangs on a fence in your garden (I have one of those...along with an outdoor clock. Why you might ask? Quien sabe.) for my part, I have lit many of the candles, holders, tikis that I own tonight...and nit's quite nice! Who knew? ?